This is by far my favorite image from this month's Domino...I actually liked the entire house -- a lot. I'm such a total sucker for the gallery wall, gallery shelf, et al. I especially love their little collection of heart rocks and the framed grouping of photo booth strips. Audrey and I have been taking snaps together every time we stumble across a photo booth... We've got a nice little collection amassed, so I'm thinking of doing something like this with a few of them. Cute, no? p.s. – there are several great shots of the Ruffalo’s house on Domino’s site that weren’t in the mag. love this look. love ruffalo. love your blog. Still need to pick up my copy but I saw this online and loved it! I just wish there were some pictures of Mark.. I love him! Yes, love the gallery wall...also loved the children's room! Your choice of fav photo was mine as well in this month's Domino. Overall great house. So livable and yet so well edited. it was so funny bc I saw that...and LOL bc I was JUST talking about how hot Mark Ruffalo was on Sat night with our dinner guests! He is so yummy! And I LOVED his HOUSE too! hee.hee. love that top photo. its perfect..the bench, the boots + the photo arrangement. gorgeous design - i love finding a featured house that i adore; i just eat up every page! I've seen these pictures a few places now, I really love the look of his house. Especially the shelves of art and whatnot. Just like I said I would, I got my copy last night... I have a couple days of scheduled bedrest next week due to a medical procedure and I can't wait to dig in to my new mag! This was definitely my favourite shoot in this months' domino as well. 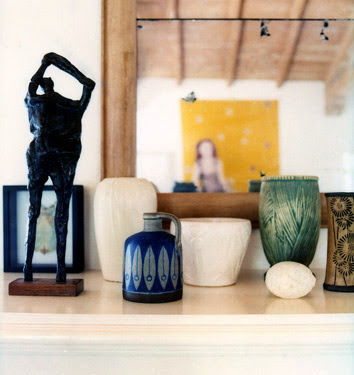 that gallery wall is to die for! 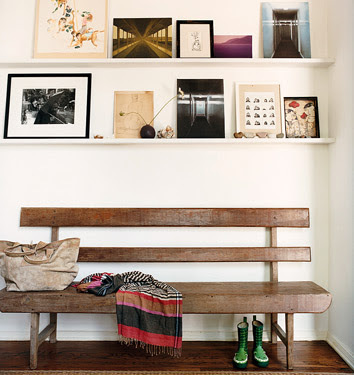 i love the idea of using white ledges on a white wall---the frames seem to float!